Quantitative research is irreplaceable when you want to count things and measure trends. The data gathered is usually statistically analysed and used in guiding better decisions. From quick surveys to guide daily decision making to large consumer research studies, quantitative studies are useful to gather data on a wide variety of questions. Is there a demand or need for your product, programme or service? How many people would be interested to buy the product, benefit from the programme or avail the service? What are the market trends in the area you wish to expand into? What are the customer trends, preferences, buying and usage habits? Why is your product, programme or service not delivering as targeted? How is the market where you are operating/targeting and its stakeholders changing? Data from this research would help the organisation’s CSR team design the budget for an appropriate program. At the end of the project, the organisation could also use quantitative research to find out the programme’s impact, measured by the change in its benefactors’ earnings. Alternately, if you are working for the government or in the development sector and would like to extend the services of a Mobile Health Van to a particular district, quantitative research will get you block-wise details on the medical facilities available per person. This will then help you schedule the mobile van visit where it is most needed. These are crucial answers that help shape projects and programs, allocate budgets effectively, measure program impact and quantitative study is the best way to gather this kind of data. Another reason why quantitative study scores over other methods is that it is relatively economical, easier to render and quicker for respondents to answer. You can use web or email based surveys that significantly cut down research costs. Paper surveys, while not inexpensive, are also simple to render for quantitative research since they don’t involve complex discussions with respondents. For respondents, filling a quantitative survey with pre-defined answer choices is much simpler and quicker than qualitative researches where respondents have to frame their answers in detail. The biggest advantage of quantitative research is that the data gathered can be numerically measured using statistical tools, resulting in sharp, unambiguous findings. This makes quantitative researches a popular choice especially, when your objective is to make quantitative predictions. Quantitative surveys are usually closed-ended, meaning that respondents have to choose options from a specified set of answers. There are also semi-structured questionnaires, where a couple of questions are open-ended. These help in capturing additional feedback and views of respondents. For a quantitative research to be successful, it need to be structured appropriately. Since the majority of such quantitative surveys would consist of closed-ended questions with fixed choices, it is imperative for the researcher to have a thorough understanding of the subject and anticipate all possible response options. How clean is your neighbourhood? How often is the garbage collected in your neighbourhood? Where do you deposit your household garbage? What type of collection mechanism exists? ‘automated collection by garbage disposal van’, ‘safai karamchari/cleaner collects from every household’, ‘collection from street bin’ etc. What do you do if the garbage is not collected as per schedule? Are you satisfied with the level of cleanliness of your neighbourhood? A quantitative survey such as this will give a complete picture of the state of cleanliness of a particular area, the frequency of garbage collection, the mechanism of disposal and the satisfaction levels of the residents. After introducing interventions to improve the cleanliness in the area, this survey can be repeated to find out anything has changed. The beauty of quantitative research is that, at the end of the survey, you will have data that is numerical. These findings can be analysed statistically and presented using charts, graphs, advanced models such as cluster analysis. This analysis can help to find a relationship between different parts of the data, even if you didn’t have a prior hypothesis. To take the example before, the data on cleanliness can be plotted on a chart and shared with government departments to exhort them to develop better solutions. A qualitative study, in this case, would be able to get generalized views and opinions of people regarding cleanliness in their neighbourhood. These findings may be considered subjective, rather than concrete data. Are numbers the panacea for all problems? The major drawback of quantitative research is that it doesn’t answer “why” effectively. While trends can be measured and counted, this type of research will not provide the opportunity to explore the context behind the trends. The data thus gathered without exploring the “why” will be inadequate to get a 360-degree understanding of the issue under study. 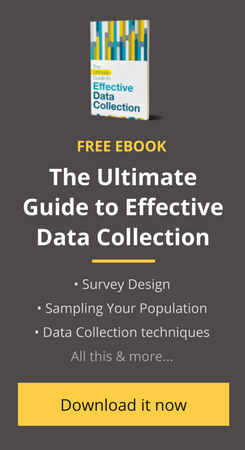 Without commissioning a full-fledged qualitative study, this shortcoming can be overcome by asking one or two open-ended questions at the end of a survey or by using Likert scales to assign ratings to opinions and translate them into numerical data. Though it doesn’t always reveal the “why” hidden beneath the numbers, quantitative inquiry is an indispensable tool in research. Without it, we will be completely handicapped at knowing what is happening in our area of inquiry, measure its impact numerically or tell compelling stories with the data. To draw reliable conclusions from numbers, sample size for the study is a critical decision in quantitative research. Besides, structuring the survey effectively and selecting the appropriate quantitative measurement tool have a major impact on study outcomes.